If you're up for some small pieces of art, hop over to ATC Sisterhood and participate in their blog hop and check out their challenges. If you're a challenge addict like me you won't want to pass up a good challenge. Supplies: 3 1/2" X 2 1/2" brown ATC-Marco's Papers, Papers: unknown small tag, SU-Naturals card stock, Stamps: Kenny K-Scarlet West digi, Whimsy Stamps-Ticket Sentiments, Ink: Ranger Archival Ink-Sepia, Copic Markers, Spica Glitter Pens, Tim Holtz idea-ology-memo pins, SU dimensionals. 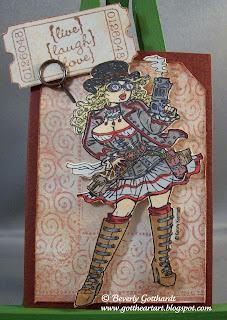 Great ATC and just love the Steampunk image - she's cool!! !